It is no secret that I absolutely LOVE my job as a newborn photographer. Newborn photography takes skill, lots of patience, the right equipment and a sense of humor when you get peed on for the third time in one hour (or worse)! I look forward to the days that I am working in my newborn studio and to meeting each tiny little client in their first days of life. Christina came to see me in at five days old to make her modeling debut and she was GORGEOUS! 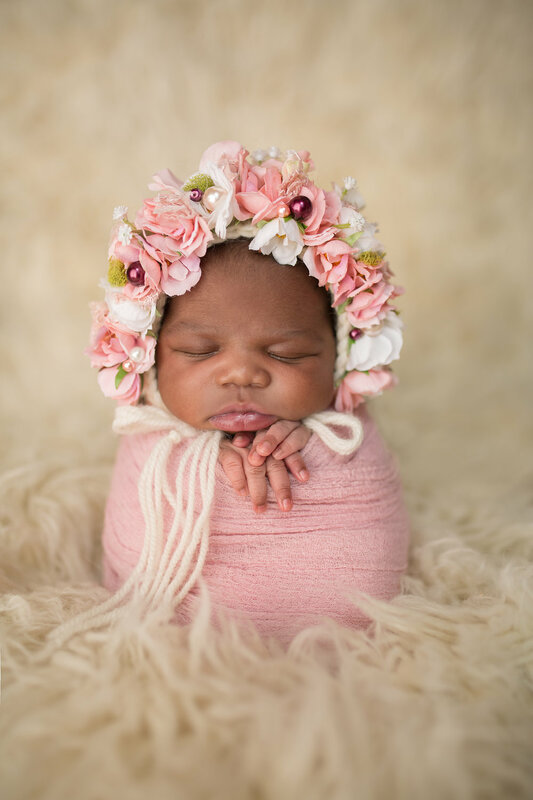 We started on the newborn poser with froggy, bottoms-up, taco pose and other basic flow posing on a yellow backdrop with aqua wrap and tieback because this little sunshine is a spring baby! We then moved into potato sack pose on flokati, and back to the poser for huck finn and lounging pose. Christina was such a rockstar on the posing bag that we had time to build in lots of posing variations and accessories like rompers, floral bonnets, halos, tiebacks, wraps and bonnets. Then we finished with bowl posing with a gorgeous boho sleep sack and matching tieback on a wood drop! Enjoy and be sure to leave some love below for her new mommy and daddy, Sheila and Chris! Are you interested in booking a newborn session for your little-one-to-be? Be sure to book during pregnancy to get a spot as they fill up quickly and ideally take place within the first ten days of life for posing purposes. Copyright © 2019 Tamsin Photography, LLC.